I REALLY want to use TaskPaper for GTD. Tried everything I I just am a plain old lists person. But keeping track of everything means interfacing with email as 90% of my tasks come in via email. 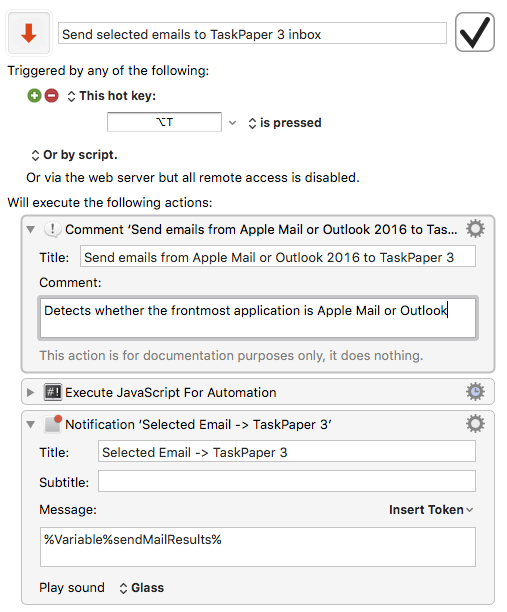 I found the mail.app macro to get messages to TaskPaper, but I can find no Outlook macros. No skill or time to learn how to write a script to do this–does anyone have an Outlook script that will send a message to TaskPaper InBox with a link back to original message in outlook? I’ll sketch something this (EU) evening. Follow the first three steps, to install the URL handler. so that it can be used (if you adjust the options at the bottom of the script) with Outlook 2016. Changing the mailApp option at the end of the script.